Mercury is boiling. Mars is freezing. The Earth is just right. When it comes to the temperatures of the planets, it makes sense that they should get colder the farther away they are from the Sun. But then there is Pluto. It has been suspected that this remote world might be even colder than it should be. Smithsonian scientists now have shown this to be true. Scientists continue to discuss whether Pluto is a planet or should be considered a refugee from the Kuiper belt. Whatever its classification, Pluto and its moon Charon are certain to harbor secrets about the early history of planet formation. Charon is roughly half the diameter of the planet itself, and they form a unique pair in our solar system. How they came to be together remains a mystery. Located thirty times farther away from the Sun than the Earth, sunlight reaching the surface of Pluto is feeble at best, with daytime resembling dark twilight here at home. Pluto's temperature varies widely during the course of its orbit since Pluto can be as close to the sun as 30 astronomical units (AU) and as far away as 50 AU. (An AU is the average Earth-Sun distance of 93 million miles.) As Pluto moves away from the Sun, its thin atmosphere is expected to freeze and fall to the surface as ice. 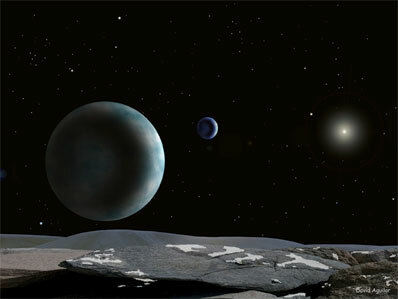 Reflected sunlight gathered with instruments such as the Keck telescope in Hawaii and the Hubble Space Telescope suggested the surface of Pluto might be colder than it should be, unlike Charon's. However, no telescope capable of directly measuring their thermal emission (their heat) was able to peer finely enough to distinguish the two bodies. Their close proximity presented a formidable challenge since they are never farther apart than 0.9 arcseconds, about the length of a pencil seen from 30 miles away. Now, for the first time, Smithsonian astronomers using the Submillimeter Array (SMA) on Mauna Kea in Hawaii have taken direct measurements of thermal heat from both worlds and found that Pluto is indeed colder than expected, colder even than Charon. "We all know about Venus and its runaway greenhouse effect," said Mark Gurwell of the Harvard-Smithsonian Center for Astrophysics (CfA), co-author on this study along with Bryan Butler of the National Radio Astronomy Observatory. "Pluto is a dynamic example of what we might call an anti-greenhouse effect. Nature likes to leave us with mysteries - and this was a big one." During the observations, the SMA utilized its most extended configuration to obtain high-resolution interferometric data, allowing separate "thermometer" readings for Pluto and Charon. It found that the temperature of the ice-covered surface of Pluto was about 43 K (-382 degrees F) instead of the expected 53 K (-364 degrees F), as on nearby Charon. This fits the current model that the low temperature of Pluto is caused by equilibrium between the surface ice and its thin nitrogen atmosphere, not just with the incoming solar radiation. Sunlight (energy) reaching the surface of Pluto is used to convert some of the nitrogen ice to gas, rather than heat the surface. This is similar to the way evaporation of a liquid can cool a surface, such as sweat cooling your skin. "These results are really exciting and fun as well," said Gurwell. "Imagine taking something's temperature from almost three billion miles away without making a house call!" This research will be presented at the 207th meeting of the American Astronomical Society in Washington, DC.